Austin Guinea Pig Rescue (formerly part of Vision Hills Sanctuary) has been rescuing guinea pigs, hamsters, gerbils, mice, hedgehogs, chinchillas, degus and the occasional rabbit and ferret since 2005 (there are local rabbit and ferret rescues). We have adopted out over 200 guinea pigs to date. We require an adoption application, and we do not do same day adoptions. We have foster homes in the Austin, Texas area. You can find us on Facebook at https://www.facebook.com/pages/Austin-Guinea-Pig-Rescue/140682055993964 and on Petfinder at http://www.petfinder.com/shelters/TX1685.html. All of our animals available for adoption are listed on Petfinder.com. We have both single and paired guinea pigs. 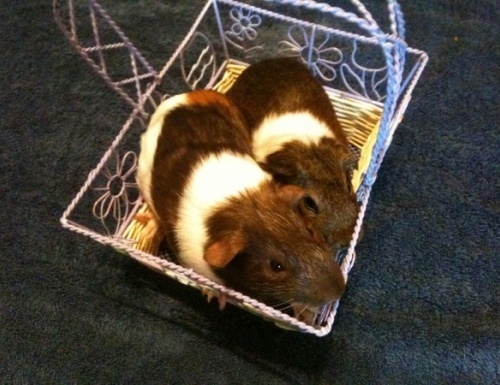 We neuter all male guinea pigs that are part of a male/female pair, and try to neuter as many other males as possible. Females are only spayed if they have health issues. If a guinea pig you are interested in has a health issue, we will disclose it, and also provide our veterinarian's contact information. We will adopt to classrooms if the teacher agrees to be responsible for the guinea pigs. We occasionally have baby guinea pigs, but only if the mother came in pregnant. We also board guinea pigs and other small animals.